On Monday 3 April 1922, Horace Moore-Jones died a hero, returning twice into a fearsome inferno to rescue women trapped by the early morning hotel fire, until rescued himself by firemen from the roof-top, his own life leaving him hours later. His overcoat was ‘practically burned off, his pyjamas scorched, his hair singed, and various parts of his body burned’. It made national headlines. Newspapers across the nation carried reports of the fire and Moore-Jones’ death day-after-day, the Waikato Times every day until April 10th. Reports of the inquest and the funeral were followed by editorials and Letters to the Editors lamenting the loss of the artist’s Gallipoli legacy to Australia and calling for a New Zealand memorial. 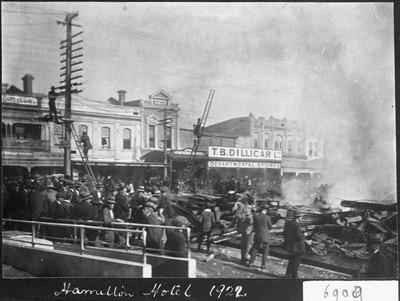 “The destruction of the Hamilton Hotel by fire involved tragedy of a particularly distressing character, and the sympathy of the whole community will go out to those whom it has plunged into mourning. As so often happens in the annals of British disasters, tragedy is touched with the epic light of heroic self-sacrifice. The circumstances under which Mr H. Moore-Jones, the artist of Anzac lost his life will profoundly move a community which is within three weeks of its annual commemoration of Anzac Day. For Mr Moore-Jones died, as he lived, an Anzac. On that Sunday night there were 24 guests plus staff sleeping on the hotel premises. Early on the Monday morning around 4am fire broke out in the kitchen and “spread with lightening rapidity” throughout the two-storey wooden structure. The Waikato Times 3 April 1922 reported the building “reduced to cinders” within the hour. As well as Horace, two others died in the flames: Auckland travelling salesman T.D. ‘Rory’ O’Moore and housemaid Nellie Wood Partridge who had been on the job for just a month. Rory O’Moore, a regular previously employed by the hotel owners was one of the oldest members of Auckland Commercial Travellers Club, today’s Commerce Club and proud owners of an original ‘Man and the Donkey’. Nellie was secretly married and her husband left her hotel bedroom only hours before the fire engulfed it. They were saving to go to Australia. Her broach was found near her body. This was “one of the most disastrous fires in the annals of Hamilton”. Flames lit up the surroundings for miles around and a crowd of some hundreds gathered at the scene, watching the firemen’s efforts into the morning. “So fierce the flames and so intent was the heat” that windows shattered in Marlborough Place and across Victoria Street in the business premises of early city leaders – Paul’s bookshop, Howden’s Jewellery store, and Bond’s stationers. The hotel was owned by brewing giant L.D. Nathan & Co., with building and fittings insured for £9600, stock and furniture a further £4360. Proprietor R.J. McKenzie carried full stocks of liquor, one cellar estimated at £1000 – all accounted in the Waikato Times at the time of the fire. Built 23 years earlier, after fire levelled the 1865 settlement original, the hotel had 24 guest bedrooms, seven sitting rooms and a “handsome dining room with seating for 60 guests”. A cottage in the “charming” riverside garden was also available. When it opened in 1899, the Waikato Argus described the new Hamilton Hotel as “brilliantly lighted, look[ing] exceedingly well and had the effect of brightening up that portion of the street considerably”. It became the headquarters of the newly formed Hamilton Club until they opened their own premises on Grantham Street. Nathans moved quickly to rebuild. A new hotel arose from the ashes and opened 12 months later, styled as ‘Beaux Arts’ in concrete and concrete block, limited to just six bedrooms and with the entire ground floor as bar area. ﻿Within a decade extensions spread along Victoria Street and added another 60 rooms. In 1981 the building was sold to charitable company Hamilton Arts Centre Ltd and developed as the Centre for Contemporary Art with the Left Bank cafe and theatre. From this came Rob Gardiner’s Chartwell Trust and the nationally significant Chartwell Collection, moved to Auckland in the 1990s. In 1985 the hotel building was listed by the Historic Places Trust as a Category 2 building. Today the original ground floor bar hosts a cluster of cafes, the upper floors apartments, in the heart of Hamilton’s immensely popular heritage and night-life zone.